Better public transport is crucial to our economy, our quality of life and our battle against climate change. 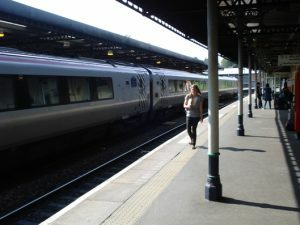 Throughout his ten years as our MP, Martin successfully campaigned to protect local rail services and to win new investment in track and station so that the nearly two million passenger journeys that now start at Cheltenham Spa each year can be quicker and more convenient for personal, business and tourist travel. Martin led the opposition to the Conservative-led County Council’s plan for a Gloucester Parkway station between Cheltenham and Gloucester when it became clear that it was based on taking services away from Cheltenham Spa. He was backed by environmentalists like Jonathan Porritt, local politicians of all parties and many residents and businesses in Cheltenham and Gloucester too. As a result of Martin’s campaign, the plan was shelved by the Department for Transport. Martin has consistently backed new investment in Cheltenham Spa station and a future development that would improve parking, access for public transport and bikes, make better commercial use of the site and meet the concerns of the station’s neighbours. Working closely with Cheltenham Borough Council and the University of Gloucestershire, he lobbied for a plan eventually supported by train operators, Network Rail and Travelwatch SouthWest and helped to get millions in funding in place by 2015. The most ambitious version could have seen two brand new bay platforms to prevent stopping trains slowing up through services and the lower part of the car park given a second tier – but this now looks like being downgraded to a much less ambitious plan since the Conservatives took office in 2015. Martin successfully campaigned for the redoubling of the Swindon to Kemble line. Two lines on this key route will allow more direct trains from Cheltenham to Swindon, Reading and London and give the whole region a more reliable railway service because trains will be able to overtake delayed or stopped services. 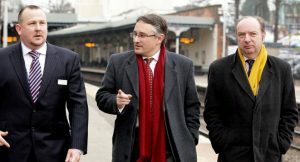 Martin personally lobbied Labour transport secretary Andrew Adonis, Conservative ministers Teresa Villiers and Philip Hammond and finally LibDem transport minister Norman Baker to secure the £45 million spending. Again working with Cheltenham’s Chamber of Commerce, Martin also backed a longer-term plan to build a Gloucestershire light rail network linking, Gloucester, Cheltenham town centre, the racecourse and Bishop’s Cleeve, possibly connecting with a new line to Honeybourne. This would be a convenient, reliable and low-impact network using routes like the old Honeybourne line and could connect with a restored main line north of Cheltenham, offering the prospect of a ‘heritage triangle’ train connection between Cheltenham, Stratford and Oxford.